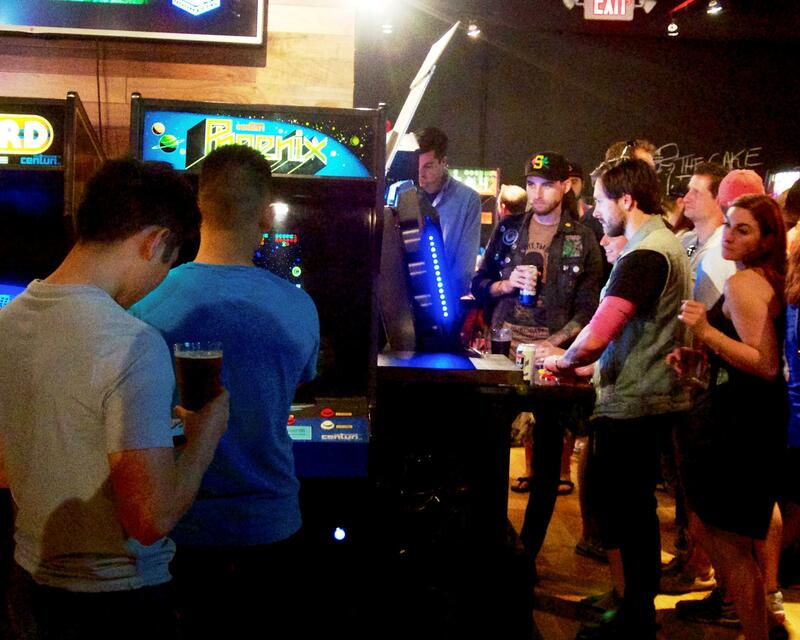 16-Bit Bar Arcade in Over-the-Rhine features food, drink, and retro video games. If you combine beer, games and nostalgia, you’re going to draw in a large crowd. That’s exactly what 16-Bit Bar + Arcade does. The opening night in early June drew in a shoulder-to-shoulder crowd. 16-Bit Bar + Arcade is packed with old school arcade games like Duck Hunt and Donkey Kong. The concept isn't new. A bar in New York started using the term 'BARCADE' in 2004 and trademarked it. 16 Bit owner Troy Allen smiles while watching customers channel their inner-child on opening night. Spencer Pruitt is excited by a game of Galaga. "Galaga is an old-school, like Space Shooter. A classic. Everybody that’s played arcade games knows Galaga. It’s right up there with Pacman, Dig Dug, all the classics. My parents actually grew up playing this game and my dad taught me (how) to play when I was younger, so it’s really cool to see it in a bar downtown." Another guest, Lindsay Menninger, is playing Ms. Pacman. "I am guiding Ms. Pacman to eat all of these little dots and avoiding all the ghosts. It was my favorite childhood game," she says. The machines are crowded. So is the bar which serves drinks named after retro icons like “Kevin Bacon” and “Molly Ringwald.” The cocktails were inspired by 16-Bit Creative Director Jared Langston. He works here and in the Columbus and Cleveland locations. Langston says more than 50 arcade games dating back to the early 70s and 80s are available at the Over-the-Rhine location. "And we have some of the newer early nineties, like the Mortal Kombats, the (Teenage Mutant Ninja) Turtles, The Simpsons, so it really hits a lot of demographics from the different age ranges," Langston says. 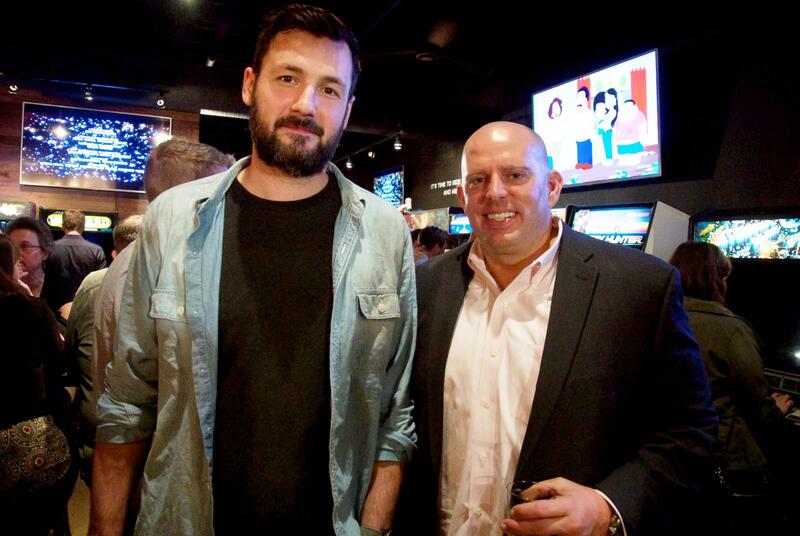 Creative Director Jared Langston (left) and Owner Troy Allen (right) at 16-Bit Bar + Arcade on its opening night in early June. Langston describes opening night as even busier than he had anticipated. He says he’s going to work hard to keep it that way. "Bringing in new games, always updating the music, new merch… It really keeps it fresh. Based on Columbus and Cleveland, we’re still doing amazing, even after an amazing opening weekend, it’s still holding up for years now." Another bar/arcade is opening in Northside this month. It’s called Arcade Legacy: Bar Edition. Owner Jesse Baker says it will be more like an arcade that just happens to serve food and drinks. The original Arcade Legacy, which doesn’t serve alcohol, opened six years ago and has now relocated to Forest Fair Village (the old Forest Fair Mall). It’s been successful enough to stay open and to fund the new bar edition that Baker’s wanted to open for two years. "We’ve been to other 'barcades' and we could see it was a good business model. It was obviously something we knew would do well. Video gaming in general is just more popular and when you add alcohol to the mix, people who may not normally come to an arcade – when they know there is drink and food – that gives them that extra reason to go." Baker says the arcade scene died out in the nineties and early two thousands. Since then, video gaming has been viewed as something people do at home alone, especially when they can play with their friends online. But now, Baker points to nostalgia for the rising popularity of the bar/arcade scene. "You want the things you had back when you were a kid. It feels good, and if someone will offer it to you in the right platform, you’re going take the opportunity and go for it." One month in, it seems that many are taking advantage of 16-Bit and are interested in Arcade Legacy: Bar Edition. Between cocktails, Pacman and friends, it’s not hard to see why.